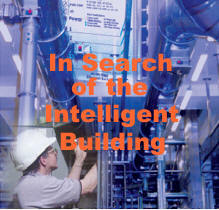 The quest for technology to enable Intelligent Buildings has been around for almost two decades. While individual definitions of what describes an Intelligent Building may vary, visionaries generally agree that technology’s role is to automate the functions of a building so improving comfort and security of both buildings and occupants. More controversially, the intelligence should also work to make buildings serve their owners better regardless of the building’s purpose: Comfortable and safe buildings make for better occupants (aka workers) and are thus good for business. Many technology initiatives have come and gone over the past two decades concerned with networking and data standards towards. The aim has always been the same: general adoption by all those participating in building systems. The surviving initiatives today are basically LonWorks, BACnet and EIB/Konnex, as well as those closer to industrial applications such as ModBus and OPC. While these have achieved some degree of success, the scope of their adoption has been limited to certain functions in buildings. None of these standards can architecturally provide the answer to all of the requirements necessary to realise the dream of intelligent buildings. While individual standards have been battling it out in the building systems space, the Internet has blossomed into a disruptive force for change; not only to core technology but also to information distribution, commerce and almost every facet of life. Internet technologies, specifically TCP/IP, web browsers and, more importantly XML and Web Services have become (or ‘is becoming’ in some industries) the only credible network and data architecture for both human, systems and device-centric connectivity. While most understand TCP/IP and web browsers, the true impact of XML and Web Services lie silently below the surface. XML is a mechanism to describe information in a manner that is flexible and can easily be communicated across TCP/IP networks. Web Services can best be described as a mechanism for applications (both system and device-centric) to communicate with each other across the Internet and intranets. The combination creates a powerful network-centric architecture enthusiastically adopted by almost all industry sectors… Banking, media, commerce, science, engineering and retail are just a few. Chances are that you have used XML and Web Services if you have booked a flight or hotel room on sites such as Expedia or Priceline, or if you do online banking. It is without doubt pervasive, but it’s true role is usually hidden from view. Thick client applications running on PC’s. Non-standard operation for alarms, schedules, trending, etc. Rich information from multiple sites and non-buildings sources (e.g. weather data). Technologies secure enough for applications such as banking, military, e-Commerce, etc. Via difficult to deploy dial-up modems. Slow and costly to maintain. The key to the architectural elegance of XML and Web Services is their inherent flexibility derived from a solid and simple set of definitions. This flexibility is especially interesting because it allows specific industries to create a set of data and behavior standards appropriate to the needs of specific applications for that industry, and yet which conform to the basic standards applying across all industries. How will XML and Web Services affect or change products, systems and applications for Building Automation? Before diving into that, it's worth noting that the term “Building Automation” in this paper is used to refer to all and any building systems that provide some form of automation for buildings, including HVAC, security, lighting, energy, vertical transport, etc. There are presently two major and distinct challenges in moving Building Automation towards the vision of Intelligent Building. First, deciding how the different elements of a building can cooperate together in an integrated manner; and second, the problem of connecting the building in real-time to the enterprise systems that now run all organisations. While proponents of existing network standards may still wish that theirs becomes the technology to link all systems together within a building, even a cursory analysis clearly shows the IP medium to be the only one that can combine TCP/IP, browser-based user interface as well as XML and Web Services. Many in the building automation industry will quickly criticise the above assertion, stating numerous challenges, including cost of CAT5 (or similar) wiring, the existing availability of a large array of products and solutions for building automation, and the fact that many existing systems will remain in buildings for years if not decades due to the typical life cycle of building automation systems. 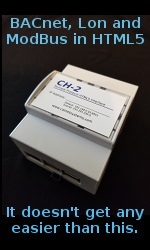 It is true that today, the cost of cabling and management of an Ethernet-based device is significantly more than the cost of running the single twisted pairs typically used to connect self-managed building automation network devices. But this is changing rapidly as Ethernet-based network infrastructure and management products become commonly available, and the skills base required to install and maintain them become wide spread. The prospect of PoE will change the balance of this equation dramatically, since the removal of the need to run power to building automation devices will bring significant benefits overcoming most, if not all of the negatives of Ethernet. IPv6 will also further drive IP based architectures for smart devices in buildings. The large number of existing and readily available non-IP devices, as well as the massive installed non-IP legacy systems base will dictate a need for gateways and other protocol translation devices. The only logical architecture of such interfaces is to ensure that data and connectivity on Ethernet and IP side is structured using XML and Web Services. Anyway you look at it, Web Services will play a crucial role in both the implementation of native IP solutions and the adoption of IP infrastructure as the integration backbone for building automation systems. The second important requirement for tomorrow’s buildings relates to their inclusion within the enterprise systems of today’s corporate and institutional organisations. Buildings produce voluminous data, inaccessible until recently, of great value to enterprise systems. Its proper use can squeeze the last drop of efficiency out of building assets. XML and Web Services provide the only realistic route to this type of ERM. Stakeholders face a challenge in figuring out the value of having buildings as a real-time citisens of the corporate information network. Just consider for a moment, that the cost of facilities is presently the second largest line item on the balance sheet for most organisations, second only to people. The value of controlling facilities at the enterprise level is two fold: firstly it enables organisations to cut operational costs be it energy, staff costs, maintenance or many other areas brought about by this level of ‘super integration’. Secondly and possibly of greater importance is the potential to correlate the affect of facilities with the performance and effectiveness of people who occupy buildings (the highest cost line item). Whether through comfort, safety or bringing about higher productivity, intelligent building systems can deliver on the business objectives of the building owner. This can only be achieved through enterprise level integration, a direct parallel with supply chain, human resource and customer relationship management by enterprise systems. The practical implementation will use XML and Web Services in both cases. LonWorks and BACnet provides standards for certain functions in the architecture. TCP/IP standards (HTML, HTTP, SSL, etc.). Chose from plethora of available IT centric routers, hubs, servers, firewalls, software, etc. Use of infrastructure tools, sniffers, etc. Consider a retail scenario. If the success of a retail unit (measured by POS data) can be correlated with inside temperature, lighting, time of day and the weather outside, even the most basic expert system could analyse resulting patterns. Such predictive behavior could also be tied into the store’s CRM (Customer Relationship Management) system to discount automatically certain items in real-time and send e-mail invitations to local customers for “daily specials” and set the temperature, music and lighting to the most suitable setting for selling those products. This scenario requires a very high level of enterprise-centric integration using tools and systems from many disciplines – all of which use XML and Web Services. Another example scenario. In airports, systems exist to manage the arrival and departures of flights. If this is connected to the environmental, lighting and security systems, the airport could turn systems into standby mode automatically when the occupancy in an area is predicted to be very light, and into full mode minutes before the arrival of an aircraft. A pleasant environment can be maintained on demand. Creative airports could also link this information to their billing system so that operators can be billed for out-of-hours usage. Take hotels as yet another example. Remembering the HVAC room preferences of a frequent guest of a particular hotel chain would be beyond the plethora of building systems with their thousands of priorities. Given XML and Web Services, it could happen. While the adoption of XML and Web Services can bring direct benefits to individual building automation systems, the real benefit derives from integration with other facility systems. So what effect of Web Services on existing standards, specifically LonWorks, BACnet, KNX, ModBus and OPC? From the author’s perspective, XML and Web Services will supplement these standards in the short term and not in any way replace them. In the longer term, new technologies such as PoE, IPv6, Power Line Carrier and wireless mesh will displace or diminish some of these existing standards. Over the next decade or two, some will cease to exist. The building automation industry is presently undergoing significant changes with consolidation the name of the game. Whereas five or ten years ago there were HVAC companies, security companies, CCTV companies, lighting companies, etc, the current major players provide all these products from a single source. The near future will see just a small handful of major vendors such as Honeywell, Siemens, JCI as well as perhaps GE, Schneider Electric, Tyco,UTC who would offer complete intelligent building solutions. But since much of the skills base necessary to provide intelligent building solutions is going to be IT-related, don’t leave out ITcentric systems integrators and consulting services companies such as EDS, Accenture, IBM Consulting. Mainstream IT as well as newer more nimble integrators will vie for a piece of the intelligent building pie. And many would argue that these players are in the best position to take the lead, from the enterprise and IT perspectives. Indeed XML and Web Services provide the technology bridge linking these two major vendor groups. It will probably be linkage, more than the fundamental technology shift, that will force the disruptive change on both buildings as well as the companies who design and fit them out.